October 5, 2010 -- Radio station KASU presents veteran bluesman Fred Sanders at the next Bluesday Tuesday, Oct. 12, from 7-9 p.m., at Newport Country Club, 703 Walker Drive, Newport. Fred Sanders was born in 1939 to a musical family in Memphis. After moving to Texas in the late 1950s, he explored blues guitar beyond the simple chords he learned early from his older brother. Soon he was a part of the Texas blues scene and remained there until 1968, when he moved home to Memphis. Sanders began a seven-year tenure at the Bluff City’s Club Paradise, playing with professional blues artists such as B. B. King, Bobby Blue Bland, Albert King, and many others. He also jammed at the Blues Alley on #1 Beale. 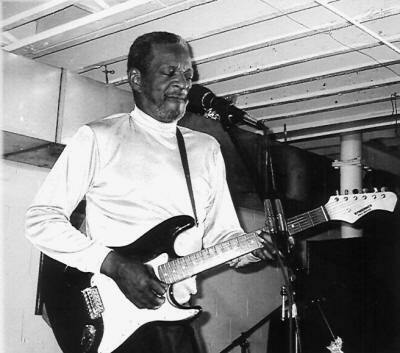 Fred Sanders then became a member of the Memphis Blues Caravan and toured worldwide. He has played with Duke Ellington’s Orchestra, Count Basie’s Band, Buddy Rich, and Johnny Taylor. Sanders has become a staple on Beale Street with his slick and playful style and, on nice days, he can be seen playing in W. C. Handy Park. Admission to the Bluesday Tuesday concert featuring Fred Sanders is free, thanks to sponsors ASU-Newport, C and C Distributors, and KASU. KASU 91.9 FM is the 100,000 watt public broadcasting service of Arkansas State University in Jonesboro, streaming its signal live on the internet from its website www.kasu.org. For more information, contact KASU station manager Mike Doyle at 870-972-3486.